Ready to take the Praxis Core? Our test questions and worked-out solutions are developed by professionals familiar with the Praxis Core. Prepare for the Core Academic Skills for Educators tests in Reading (5712), Writing (5722) and Mathematics (5732) with our comprehensive instruction and 12 full-length practice tests. You&apos;ll get hands-on experience with different question types that you&apos;ll see on test day. 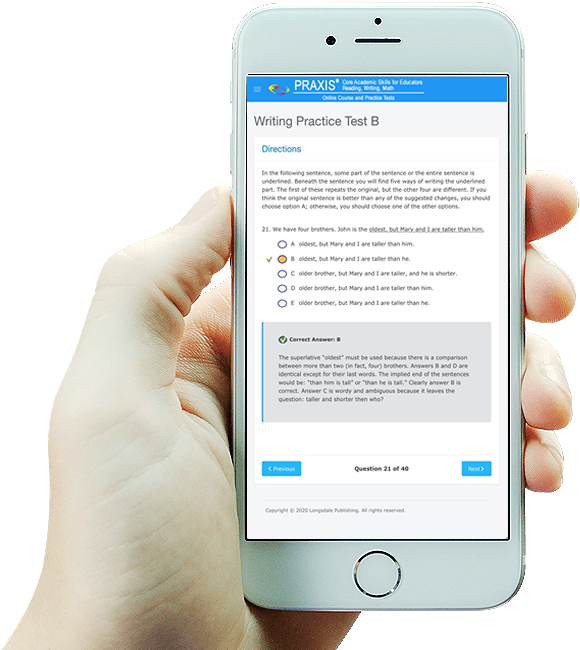 In addition, you can view your results after you complete the practice test and get detailed explanations of correct answers to the practice questions. The instruction is flexible, so you can begin working through the material from the beginning covering all sections, or you can navigate to areas of specific need. We decided to place the testimonials right where you can find them not only as a thank you to those who have put in their hard work, but also for those of you who have yet to take the Praxis Core and may need some inspiration and/or confirmation. All of the testimonials you see below are from individuals who used our Praxis Core preparation program. "We have been using the Longsdale practice Praxis Core online tests as part of our preparation for the mandated entrance assessment, the Test of Basic Skills. To be able to become accepted into the Teacher Education Program, students must pass all modules of the Praxis Core. 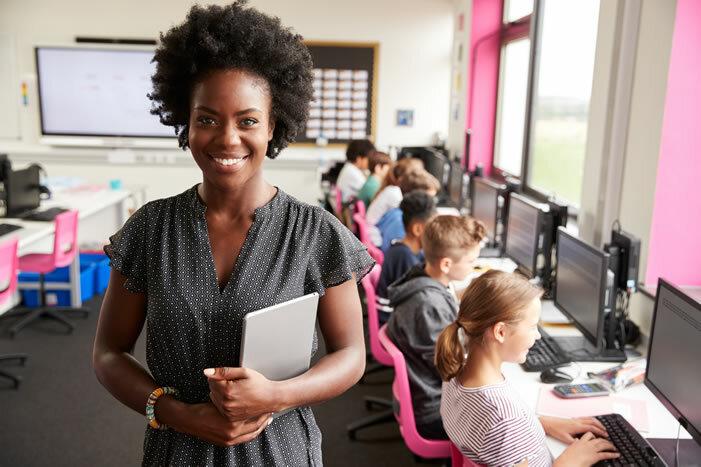 Therefore, our Teacher Education program has used the Longsdale product for several semesters, and we find it to be an invaluable tool in helping students prepare for the actual Praxis Core. We especially like the individual self-correction aspect; it is targeted, student-specific, and succinct in helping the student gain understanding. The independent learning approach is extremely student-friendly. I have taught test prep courses in the past, but it is hard to individualize in even a small class. However, the practice tests do exactly that: they target the learning needs while reinforcing the already mastered material." "Longsdale Publishing is a reliable and beneficial resource in helping future educators study for the Praxis Core. I have found that using this resource has helped increase my test scores. Thank you Longsdale Publishing for allowing students like myself to use your resource." "The Math practice tests are very useful in preparing for the Praxis. I like the timer because it helped me be aware of how long the actual test takes and to use my time efficiently. Also, the ending test results let me know my mistakes by giving steps on how to solve the problems correctly. This is extremely helpful. Thank you for giving a variety of tests too which will help me feel confident when taking the Praxis." "I feel that this prep course helped to prepare me for the Praxis. I really had no idea what to expect before taking the practice tests, but the tests were very similar to the actual Praxis. The tests helped me to identify what areas I should work on before taking the Praxis. I really don't think my scores would have been as good without this course." "I have to tell you that our students love this online site and it has been extremely helpful to them." "I have definitely found your program to be helpful. By utilizing the program and the resources, it has given me a broader idea as to what to expect on the test, and I feel better prepared. I also appreciate the ability to have feedback right away on my writing. By having professionals critique my practice writing, I can learn my strengths and weaknesses, and use the information to better prepare myself for the test. Thank you again." "Writing timed essays is a great way to improve your writing. I used the strategies of brainstorming and outline creation to form a flowing coherent essay. Being timed causes me anxiety, so practicing writing an essay and knowing that someone will be reading it helped immensely. The feedback given was prompt, specific and helpful causing me to develop my weaknesses so that I passed the Praxis." "I took the practice tests about a year earlier than what my four year college was requiring. Thanks to the studying, I passed my pre-service tests no problem and now stand out in my peer crowd because of it!" "I found the Praxis Online Course & Practice Tests to be very beneficial. It allows you to get an inside scoop on what to expect on the test. Without this, I don't believe I would have scored as well as I did." "I really like this site! I haven't retested but I am a lot more confident. Using the practice material and tests have helped me to focus on what I need to study to be prepared and speed up my responses." "For my many students who are particularly busy with their academic coursework, outside work, and family life, the online tests to help prepare these students have been very worthwhile." "I have dyslexia and was extremely nervous about taking the praxis test. The practice tests from Longsdale Publishing gave me the confidence to not only succeed but to excel when actually taking the real test. I passed all three tests with high scores on the first try. Thank you Longsdale for your wonderful product." "It was very helpful in giving me the advantage of what to expect on the actual test. I did not have anxiety when I took the real test because I was familiar with the style of the questions. I would recommend using this product." "The Praxis preparation program is very helpful. It has more content to study than the program offered by ETS. I love the different test forms provided and the content is relevant to the praxis." "Using this course really helped me understand the material. I liked how after each question it gave you the correct answer and an explanation. Without this course I definitely wouldn't have done as well as I did." "I am a senior and I must admit being intimidated by the prospect of taking the Praxis for educators. This practice has helped me to prepare for confronting the unknown and helped me to gain the confidence to complete my goal of becoming a teacher. Thanks for the help!" Who writes the Praxis practice questions? Our expert instructors, who have decades of experience and have taught thousands of students, create our Praxis practice questions and explanations. Absolutely! Staff and faculty from postsecondary institutions may request an unrestricted preview of both the student and instructor sections of our Praxis Core Online Course and Practice Tests program for evaluation purposes. The cost of a one-year license is $950, correct? Are there any other fees? The cost of the one-year license is a flat $950. There are no other fees. Student uses are available for one year from the purchase date. For example, if you purchase 20 Student Uses for $500, 20 students can register to use the program from the date you make the purchase. Once registered, a student will have one complete year to use the program regardless of the date they register. Below are the annual discounted prices for the Praxis Core Online Course and Practice Tests Site License. Praxis® and Praxis Core® are a registered trademarks of Educational Testing Service (ETS), which is not affiliated with Longsdale Publishing, Inc.